Maldives is weathering a severe political crisis following the Supreme Court’s February 1 order to release political prisoners and reinstate 12 Members of Parliament. President Abdulla Yameen declared a state of emergency and cracked down on all protests. The media and journalists are facing a challenging situation. 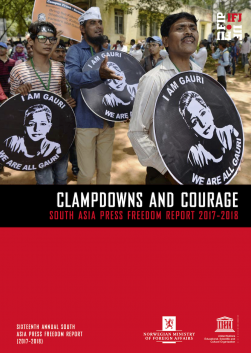 The South Asia Media Solidarity Network (SAMSN) is monitoring the situation and this live blog will be updated with important information related to press freedom, media and journalist’s rights. 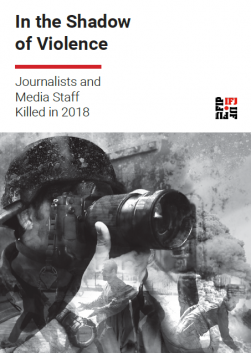 The IFJ has issued statements (here and here) and together with RSF and CPJ a joint statement on the situation in Maldives calling government to respect rule of law, press freedom and journalists’ rights. The 45-day state of emergency ended. Raajje TV journalist Mohamed Fazeen, who was arrested near a demonstration calling for President Abdulla Yameen’s release in capital city Malé, released. The journalist was arrested in ‘disobeying police orders’. The criminal court remanded Raajje TV‘s senior video journalist Mohamed Wisam and Head of Programmes Amir Saleem for 10 days. Both Wisam and Amir have been charged with identity theft and attempting a criminal offence among many other offences. MP Abdul Raheem Abdulla, the deputy leader of ruling party PPM, called on authorities to have privately-run Raajje Television shut down. The parliamentarian, in a press conference broadcast live on Public Service Media, accused the three RaajjeTV staff, Head of Programmes Amir Saleem, and journalists Mohamd Wisam and Mohamed Fazeen of having staged a video that the police said they are investigating. The police service arrested Raajje TV journalists Mohamed Wisam, Mohamed Fazeen, and Head of Programmes Amir Saleem were arrested. They were arrested on March 16. Fazeen was arrested while covering the protest by the Joint Opposition for allegedly disobeying a police officer, while Wisam and Amir were taken into custody with a court order. Amir was arrested outside the RaajjeTV station. Maldives transport authority urged the media against spreading unsubstantiated reported regarding Xin Yuan 18 – a vessel with the Maldivian flag that supplied oil to North Korea. The authority was denying any link to the vessel. The Supreme Court legitimised parliament’s approval of state of emergency with less than half of lawmakers present for the vote. The court said that the constitutional quorum of 43 MPs for voting on “any matter requiring compliance by citizens” was inapplicable as a state of emergency declaration was not among such matters listed in the parliament’s rules. Police dispersed journalists with pepper spray at the opposition rally. Police officers stormed Jumhoree Party (JP)’s campaign site and pepper sprayed everyone inside directly in the face when MP Abdulla Ahmed was giving a press interview. 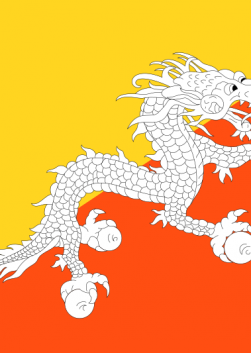 The Election Commission announced that first round of presidential elections in early September. A second round, should it be necessary, would be held within 21 days from election day. The Parliament approved extension of the state of emergency by another 30 days on President Abdulla Yameen’s request. Only 38 MPs, all from ruling party, were present for the vote, which took place hours before the state of emergency was due to expire, despite 43 lawmakers being needed for the vote to take place as required by the constitution. Opposition lawmakers boycotted the session. RaajjeTV’s journalist Hussain Hassan travels to Sri Lanka for further treatment, despite police’s attempt to arrest him at the airport. Hassan had checked in and had passed immigration and was at the boarding gate when officers tried to block him from flying. However, the officers were unable to take him into custody as he had already passed immigration, “meaning he was already on international soil”. The Maldives police in a press release ask journalists to be “more professional”. The police claimed that some journalists had acted like ‘protestors’ on February 16 rally and some media outlets had spread misleading information during live coverage. The Maldives Broadcasting Commission issue a circular saying that some broadcasters were airing content threatening peace and stability and cautions broadcasters to exercise restraint ‘when bringing live coverage’. Hussain Hassan from RaajjeTV and Leevan Ali Nasir from VTV are arrested during a protest rally at Male. “One of them deadlocked my neck in his arms and then dragged me out of the police van. While he dragged me on the ground and into the police station several other officers hit me,” Hassan told the Maldives Independent. Around 20 journalists were taken to hospital after being pepper sprayed. PPM lawmaker Ahmed Nihan alleges in a tweet that the protests had been organised by the media: “We see tonight’s rally being led by journalists from RaajjeTV and VTV”. Mohamed Riyaz, technician with Vmedia, a news outlet owned by opposition leader Qasim Ibrahim, arrested while assisting the channel’s crew covering the opposition rally calling for the implementation of the Supreme Court ruling of February 1. He was later released. Raajje TV resumes regular broadcast after 56 hours off the air. Raajje TV suspends its regular broadcast due to “increased harassment, threats and intimidation” and what it termed an “unsafe environment for journalists to report freely and independently, and without fear”. It also said that the Maldives Police withdrew security provided to the station, which has weathered several attacks in the past. Two journalists working for the Agence France-Presse, Indian photographer Money Sharma, and British videographer Atish Patel, picked up by police for doing journalistic activities on tourist visa and told to leave the country. The Ministry of Defence and National Security warns of action on parties found to have brought forward content impacting national security without a prior notice. The statement added that live shows and programs on media could “create chaos, confusion in public and create discord within the society”. Police arrests Chief Justice Abdulla Saeed and Justice Ali Hameed from the Supreme Court on allegations of corruption while passing the February 1 ruling. Supreme Court amended the February 1 ruling to annul release of political prisoners. President Abdullah Yameen declares a 15-day state of emergency suspending fundamental rights including the right to privacy and freedom of information. Maldives Independent website comes under hacking attack. Our website @IndependentMV is down again after attacks to server intensified following live blog. The deputy leader of the ruling Progressive Party of Maldives (PPM), Abdul Raheem Abdullah, calls on security forces to immediately shut down Raajje TV, accusing it of giving airtime to the opposition leaders. Maldives Broadcasting Commission (MBC) warns that any media station that impacts national security will face closure, without any warning. Commission Member Ismail Safwan said that any and all television stations that broadcast content that impacts on national security will face closure. He says that any and all stations that broadcast “fake” news reports that “impacts on national security and national interests” will be reviewed and action will be taken if necessary. The Supreme Court orders the release of opposition political leaders and reinstated 12 suspended Member of Parliaments. The order effectively puts President Abdullah Yameen’s government in a minority. The government refuses to respect the Court’s orders and subsequently arrests the Chief Justice and another judge. After this action, the remaining judges annulled the original order. 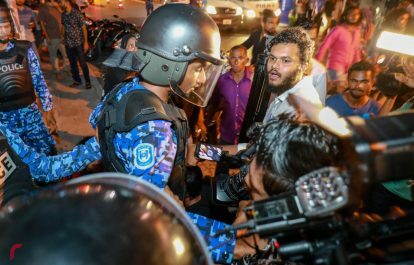 Police question journalists at the news websites Avas and Mihaaru after the sites publish a statement issued by the jailed former vice president of the Maldives, Ahmed Adeeb.